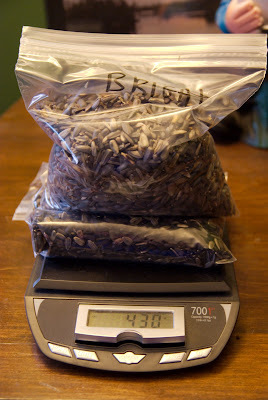 This past weekend, I finished harvesting my sunflower seeds saved from last year and planted them. 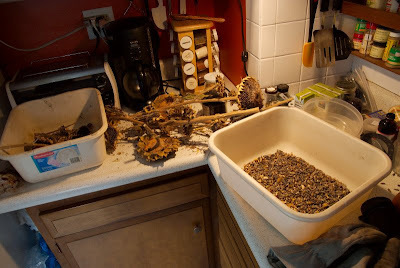 Here is the workspace in the kitchen where I separated the seeds from the heads. It made a huge mess. Then, I took them outside and used a box fan to separate the crud from the seeds. 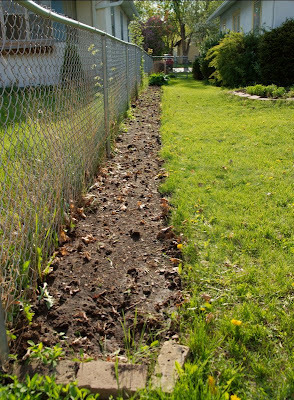 I planted all the crud (which had lots of seeds in it too) in our "sacrifice" bed where nothing likes to grow. We'll see if there's any success. Here is the result. There are lots left, though sadly I lost my notes on how much exactly I planted. It was a lot, since I was too lazy to look up the actual recommended spacing, last year I followed the directions and didn't get enough plants, and Erin was worried about the viability of the seeds. Here's the bed, all 130 square feet of it! There are also beans mixed in. Last year, we got back about as many beans as we planted; hopefully we'll have better luck this year. I planted at most 537g of seeds but I think it was more in the 250g range.